John Molyneaux expressed his delight as the Fareham Nomads doubled their Hampshire Championships medal count from last year, writes Tom Bonnett. 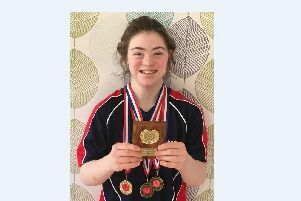 Amelia Boyes headlined the success for the Nomads by achieving a gold medal in the 13 years 50m freestyle with a time of 29.27sec. She also claimed a bronze medal in the 200m freestyle, improving on the seventh-placed finish she registered last season. Fareham Nomads head coach Molyneaux said: ‘Amelia has really stepped up this year. The Nomads have already picked up nine medals in the 10 to 14 age categories – surpassing the four they recorded last season. The 15 to 18 age groups will take to the water at the Mountbatten Centre this weekend – as the championships draw to a close. And the Nomads will be looking to add to their tally. Boyes also claimed a gold medal in the 4x50m relay – where her team-mates included Evie Hall, who herself claimed a silver medal in the 50m freestyle in the 14 years age group. Molyneaux added: ‘Evie was another one who stepped up to the occasion. ‘Last year she finished eighth in the 50m freestyle, so to make that jump to second is a great achievement. ‘It was a great competition, not only for Evie and Amelia but for the whole club. ‘We are building a solid base of swimmers who are all achieving well at a young age. Meanwhile, Havant & Waterlooville’s Adam Taylor claimed a bronze medal in the 100m backstroke – qualifying for southern regionals later this year. Head coach Graham Pople has recently undergone knee surgery and returned to training last week to prepare the older age groups for the final weekend of Hampshire Championship action. Katie Byrne and Austin Slade-Jeffrey will headline the strong arsenal of Havant swimmers competing. Byrne finished as high as fourth place in her multiple national finals in 2017. She will begin her road back to the British stage this weekend. Slade-Jeffrey also made it to the nationals in last term and will be joined by Theo Rogers, 16, competing for the top spots in Hampshire. Click here to read Portsmouth Northsea’s take on the Hampshire Championships so far.